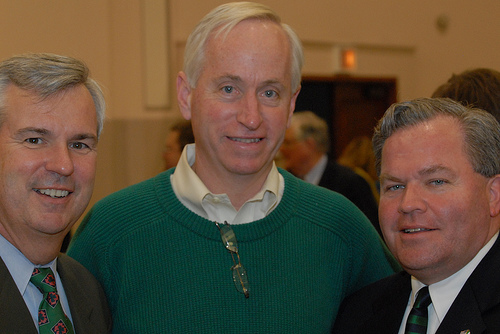 I like this picture of three major movers and shakers in Chicago Politics. These men have done quite a bit to make Chicago better. Photo by Patrick McDonough. Dennis Gannon lost a lot of credibility in the 2006 and 2008 elections. He tricked rank and file members to support Todd Stroger. He went against union friends in 2008.
the three Stooges. LOL, naw just joking, Pat who are these handsome men. Dennis Gannon is a St. Thomas More Graduate of the Class of 69! He will do the right thing!